The date on which the supplier receives the payment shall be the date on which the payment is entered in his books of account or the date on which the payment is credited to his bank account, whichever is earlier. 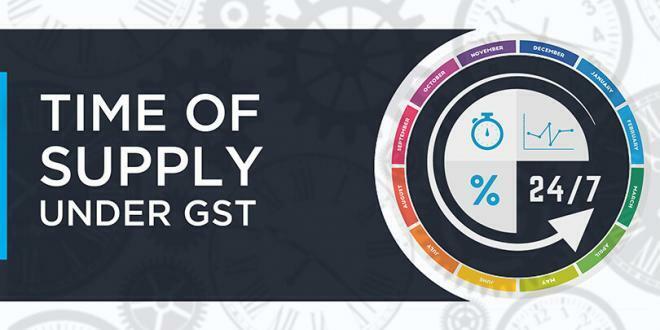 From above provision it is clear that GST is payable at time of receiving advance payment. At time of receiving advance payment, a Receipt Voucher is to be issued. The person making advance payment is eligible to take input tax credit only after generation of invoice. Refer to this guide on advance payment. In case where date of supply can not be determined by above method, the time of supply shall be the date of entry in the books of account of the recipient of supply. In case where date of supply can not be determined by above method, the time of supply shall be the date on which the recipient shows the receipt of services in his books of account. the date of payment as entered in the books of account of the recipient or the date on which the payment is debited in his bank account, whichever is earlier. the date immediately following sixty days from the date of issue of invoice or any other document, by whatever name called, in lieu thereof by the supplier. In case of supply by associated enterprises, where the supplier of service is located outside India, the time of supply shall be the date of entry in the books of account of the recipient of supply or the date of payment, whichever is earlier. Provided that the date of receipt of payment shall be the date of credit in the bank account if such credit in the bank account is after four working days from the date of change in the rate of tax.